We present a 3D edge detection approach for RGB-D point clouds and its application in point cloud registration. 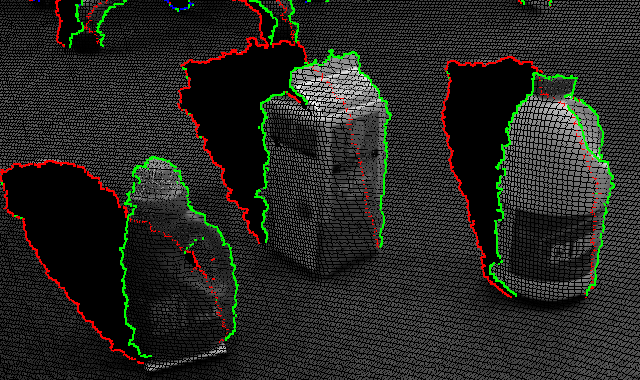 Our approach detects several types of edges, and makes use of both 3D shape information and photometric texture information. Edges are categorized as occluding edges, occluded edges, boundary edges, high-curvature edges, and RGB edges. We exploit the organized structure of the RGB-D image to efficiently detect edges, enabling near real-time performance. We present two applications of these edge features: edge-based pair-wise registration and a pose-graph SLAM approach based on this registration, which we compare to state-of-the-art methods. Experimental results demonstrate the performance of edge detection and edge-based registration both quantitatively and qualitatively. This work was mainly funded and initiated as a project of Google Summer of Code 2012 and the Point Cloud Library (PCL). The work has further been sponsored by the Boeing Corporation. The support is gratefully acknowledged. C. Choi, A. Trevor, and H. I. Christensen, “Rgb-d edge detection and edge-based registration,” in Intelligent robots and systems (iros), 2013 ieee/rsj international conference on, Tokyo, 2013, pp. 1568-1575.